Franklin Falls is a waterfall on the South fork of the Snoqualmie River, the first of three major waterfalls on the South Fork Snoqualmie River. 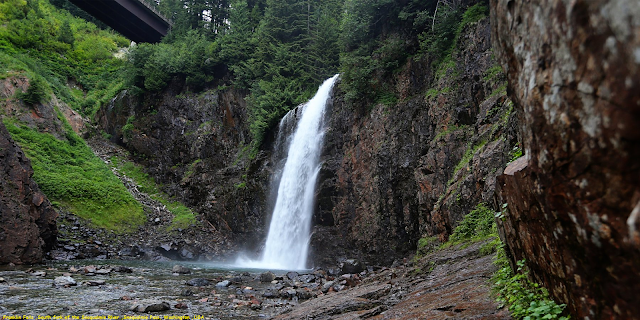 The falls are located near Snoqualmie Pass in King County, Washington, United States, between the north and south lanes of Interstate 90, just east of exit 47. The falls actually consist of three tiers, totaling about 135 feet (41 m). The first drop is a very scenic 15-foot (4.6 m) block-shaped fall. The second drop is a 25-foot (7.6 m) fanning cascade. The final drop begins as a 25-foot slide, which bends to the right, then plunges over the final 70-foot (21 m) drop seen from the base of the falls. The falls are popular destination. The upper two drops are north of the freeway. The trail includes a number of stairs with a very gentle incline that is easily hiked. As you hike, you'll be enshrouded in a thick canopy of coniferous trees which makes it a great trail to do on a hot day.